That’s the beauty of our Pronto Mama Harrissa Sauce – it goes so well with anything, whether you use it as a marinade or a sauce. 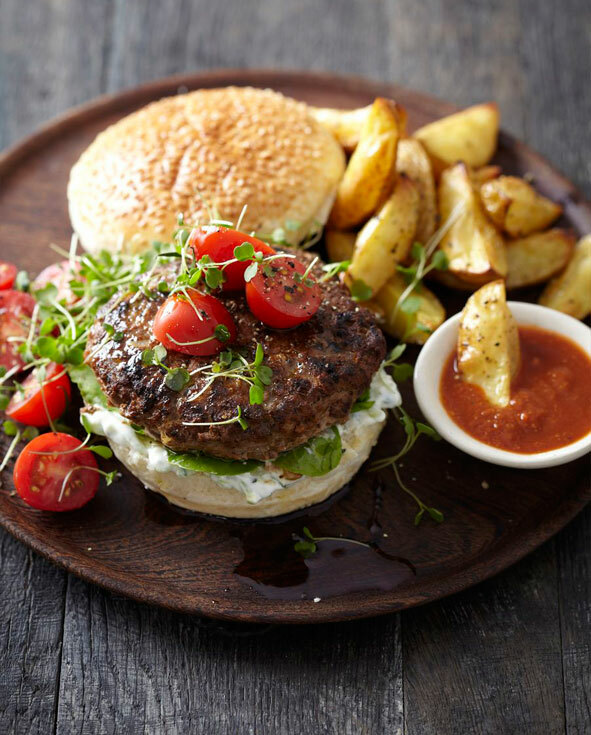 It loves burgers and will perfectly compliment this lamb burger, served with tzatsiki. Quarter the potatoes and place in a pot of cold water. Bring water to the boil and cook until potatoes are just soft but not cooked through. Transfer potatoes to a foil-lined roasting tray, drizzle with the oil and season well with salt and pepper. Place in the oven and roast until golden brown and crisp. Meanwhile combine the mince, cumin, coriander, onion, harrissa and a clove of garlic. Season to taste with salt and pepper, divide into 4 equal portions and shape into big burger patties. Make them a bit larger than the buns as they will shrink. Heat a frying pan with a little sunflower oil and cook the patties until golden brown and cooked through. In the meantime, mix the yogurt, mayo, cucumber and garlic together. Chop the mint and add it. Assemble your burgers with tzatsiki, a pattie, some tomatoes and micro rocket. Serve with the potato wedges and some extra harrissa sauce for dipping.